Last Friday, I got off work early, so I picked Tobin up from school instead of Matt doing so. Tobin and his class were still outside, and their teacher was passing out little cups of water for them to drink. This made for a hilarious scene with little ones milling around and, among other things, spilling water, on purpose and not; pointing at ice! in each other's cups; and sitting down cutely on a little bench to politely sip water next to a friend. Tobin, by the way, did all of these things. A couple of the kids were pestering each other, and Tobin's teacher said, "Conner, be nice." And there was an echo of this in a familiar little voice. Then his teacher said, "Angus (yes, a serious name for a little boy but this kid is really cute), be nice!" And, again, the little echo. Yes, Tobin had taken it upon himself to repeat his teacher's mild reprimands. I asked Tobin if he was telling Angus to "be nice," which he confirmed by saying it again. I thought this was adorable. So when we were hanging out with Hannah later and she predictably started barking at some unknown threat to our safety (a squirrel! a car! our neighbor! ), I told Tobin to tell her: "Shh, Hannah, be nice!" Which he did, repeatedly. Fast forward to yesterday when Matt picked T up from school and spent a few minutes playing outside by throwing a ball to Tobin and a few of the other kids. At one point, Matt threw the ball in Tobin's direction and Angus tried to intercept this pass. Unsuccessfully. Oh yes, Tobin, who is developing catching skills of late, caught the ball instead. Then my sweet, little, cherubic son gave Angus a hard shove in his chest. (Gasp! Sniff.) Angus stumbled backwards but didn't fall, and seemed miffed but not upset. Matt immediately scooped T up and said something like, "No, we don't push our friends, Tobin." Sensing this was probably a good time to leave, Matt took Tobin inside his classroom to wash his hands before heading home. While at the sink, Matt asked, "Tobin, do we push Angus?" Tobin did this thing he's started to do when admonished: rolled his eyes. It's not an annoyed eye-roll but more like an attempt to avoid eye contact; he does a similar thing when strangers try to talk with him. (Ha!) And then Tobin answered his dad's question (about whether pushing Angus was appropriate behavior) with a drawn-out "Noooo" while shaking his head. T then added: "Tobin, be nice!" At which point, I imagine Matt lost his attempts at being a stern disciplinarian and cracked a smile. And might have even laughed. And, of course, praised Tobin for an excellent answer! We're in Louisville for my Spring break. 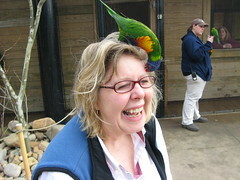 Last week, when we were planning our trip, my mom mentioned that we could visit the Louisville Zoo. They have a 1-year-old elephant named Scotty. I don't remember how Tobin first heard the phrase "baby elephant," but it's been a regular part of his vocabulary ever since. After some rain in the morning, the skies cleared Monday afternoon for our trip. Tobin, his mom and dad, and his granddad and grandma all piled in the van and headed off to the zoo. We had such a good time we stayed until the zoo closed for the day. The weather was perfect and Tobin was in good spirits. 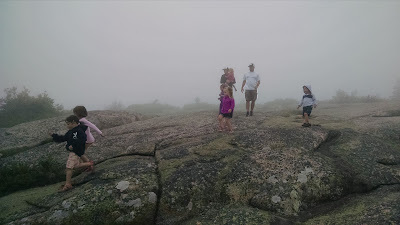 Below are a few pictures and a couple of videos we'd like to share with you. 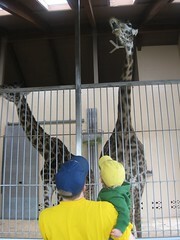 First, we saw giraffes, which Tobin loves because of the song "Joshua Giraffe" by Raffi. Tobin kept saying "Big Josh!" when we saw them. After that, we saw the elephants. Tobin correctly identified them (ep-pitants & baby ep-pitant alike). 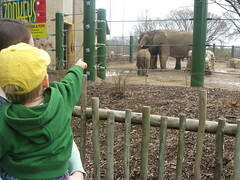 He pointed to them and even remarked "Pee-yew poop" when one of the elephants deposited significantly. Tobin brought home a stuffed giraffe and a stuffed turtle from his first zoo trip, but the memories I'll keep from his first trip to the zoo are my souvenirs. Granddad suggested a dinner out, so we left the zoo for a nice meal (see Allison's previous post).